intro beat – Iain “F a Quantize” Haywood – Switch on the MPC. myspace.com/12pads. What’s this about UK and US releases in 08 son? Hit the comments, do tell. Marco Polo – The Radar feat Large Professor. Large as a guest MC, not a producer. Don’t get it confused though, the drum work on this still goes hard. myspace.com/marcopolobeats. Tom C3 and Prince Po – Can’t Stop Won’t Stop. The first couple bars of this song reminds me somehow of Lord Quas’ “Come on Feet” for some reason. I was wondering why I hadn’t heard of Tom C3 until I realized he did the Dopestyle 1231 jumpoff (brilliant album art, by the way). Shouts to Nasty Nes for this one. myspace.com/tomc3. NAAM Brigade – Greatest Man Alive (remix). Well, actually this is more Sonny Black than anything, but still. I’ve heard of these dudes referred to as the Philly Wu-Tang. Who do I need to get on the phone with to figure out what the hell happened to these dudes? You heard them back in Episode 97 with the Message rework. While all these college-rap dudes are trying to recreate some boom-bap sound, NAAM Brigade somehow manages to dig into the early 90s/late 80s with their production and still sound absolutely rough and fresh with the final product. Jay Electronica – Uprock. Definitely different production from what most have heard of Jay thus far, but damn the dude just eats this breakbeat up. The one man live band strikes again. Jay, if you ever do release Act II, you know you got a home for it here too. dexalude – [instro: RJD2 - Inhale (remix)]. Internet rumors are crazy. Bekay - Hunger Pains (prod. Alkota). Like I said, I’ve been following dude for some time (I actually remember his joint with ODB – I think one of the last he recorded), but nothing was quite my flavor – until now. This song isn’t all about “oh I’m white poor me”, but – or what I get from it, anyway – just a series of really screwed up events and situations that often trace back to a uniquely neurotic and American racism. Kinda hard to make it in a minstrel industry without black skin. myspace.com/bekay. And for the record, the dude sounds nothing like Eminem to me. Labratz - Creation. So does anyone actually have faith in this straight-ahead government process? I wouldn’t really call myself cynical, but my optimism never really involves fantasizing about real change being brought about through the election of some public official. Black leadership has really fallen off. As much as I dig the instrumental on this one, you really have to pay attention to the lyrics on this one. I’d quote some here, but seriously, just listen. And then repeat. Why is it so cold? Anyway, order other news: Giveaways, rx son! Yes, I do have 5 copies of 2K Sports’ NBA 2K8 for XBOX 360 (USA version) up for grabs. Merry Christmas, etc. Listen to the show to get details on how to grab your own copy and then post up your ideas in the comments. And as I said, 3 of them will be going out on the site, and two will be going out on the Mixtape Show Facebook Group – you gotta be in it to get the info on how to win one (click here to join up). Massive, massive shouts to DJ Spaceboy at 2K for making this possible. 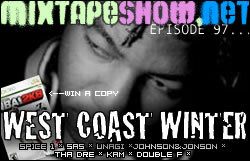 This ep – just West Coast all over the place. You’ll like it, I promise. Tha D.R.E. – Wild Child. I can’t necessarily vouch for the rest of the record, but for anyone who appreciates Bay Area rap, this cut is a gem. Oddly enough, dude is from Milwaukee. Unagi – Mo Champagne feat Motion Man. Unagi hit me with this cut and I think I played it 8 times back to back. The dude really is just dope with the loops. unagi442.com. Johnson&Jonson – La La La. Yes, Blu is in here. Seriously, how are they going to clear these samples? Jon, can you shed some light on this? Either way, this is really dope. (You’ve heard – and seen – Johnson & Jonson here before, by the way). Something to look forward to ’08 – the Powders and Oils album. myspace.com/jandjbabyproducts. I’m not pretending to understand the name, though. Spice 1 – Playa Man. Again, get well soon, dude. I’m really just now getting into this cat’s music. myspace.com/spiceone. Dam Funk – December Sun – At some point the two of us are going to link up and just give you all a ridiculous show. Dam is just too funky with the beats. I know I talked all over this one, but you can go get yourself a listen at his myspace. Check for him on the new 2K8 soundtrack, too. myspace.com/damfunk. And on a related note, I know I’m kinda opening myself to the flames by calling anything a “West Coast” episode. Too much great music out here – again this is just a slice of the diversity out here. Feel free to let the recommendations fly in the comments. Yo, refractionist what it is? I got a couple of things to drop on you all today. 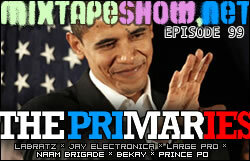 First, salve I’m currently compiling material for the second and third episodes of the mixtape. I might be able to get another couple tracks in, so if anyone out there has somethin they want me to hear, get at me. Be looking for the first new drop in the coming week. Second, although not all of the artists that are featured on here have sites (or even working phones, damn), some do. I’m gonna do my best to link you all up with info on each artist so that you can get more of their material without having to google around for it. With that in mind, then, I gotta give a shout out to Akir – you heard him last week – you can check some of his tracks on that site, for free. And if you’re in the D.C. area, you might even be able to catch him live on the 27th.